Since 2002 “Azpetrol” Company has provided its customers with card payment system services (Petrol Plus offline). Due to growing number of service users with each passing day, the Company has shifted from the previous system to Petrol Plus online payment system with a view to rendering more convenient, high-quality and reliable services. At the request of customers, along with smart card payment system, the Company has launched electronic coupon services (EC). EC is a one-off service and the customers are not allowed to reuse it. Each and every personal account holder on “Azpetrol” online fuel sales system (http://pws.azpetrol.com) can benefit from electronic coupon services. In the process of creating an EC account no amount is written off from a customer’s account until the service is rendered. Go to Services menu and click on Non-cash Payments, then claim private and order code tables. 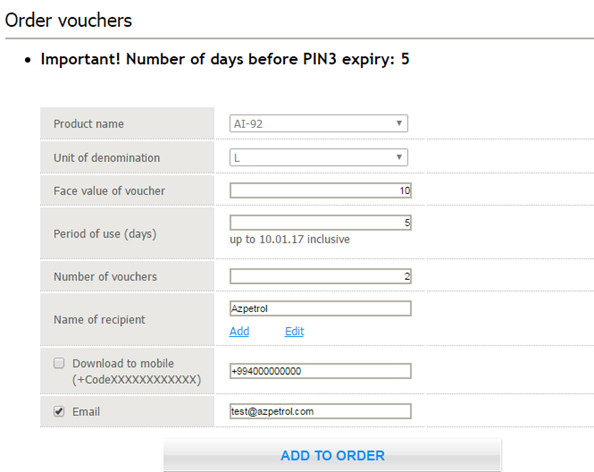 Log in to your Personal Account and select Order vouchers menu and you will proceed to the following window (Picture 1). Having filled in the sections on the abovementioned window click on Add to Order (Picture 2). Please note, you can receive your coupon via e-mail or mobile phone. To place an order, it is required to select either one of these methods or both of them. This will allow you to add one or more ECs to your order (Picture 3). Make sure you enter your EC precisely, then click on Order, and once again you will see a new window (Picture 4). Enter the order codes that you have received from Non-cash Payments section and click on Confirm Order. By this way your electronic coupon order is submitted, and in 5 – 8 minutes you will be sent an e-mail or a message related to your order (Picture 5). To follow up your order, go to Requests menu and click on View the Applications Made for Coupons and the following window will open (Picture 6). 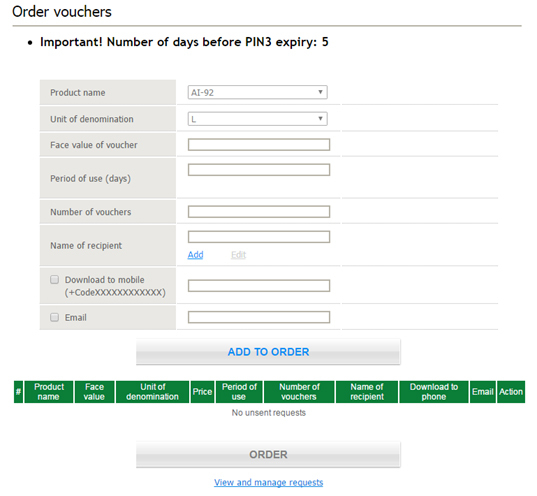 In order to keep abreast of EC status, go to Vouchers menu and you will come across the window below (Picture 7). The number of EC is available only to the Receiver and not displayed on any other menu or section. When come up to Azpetrol gas stations bring your EC (e-mail or SMS) along with your Private Code; thereby, you can fill up your car’s tank.